The Pinesap suddenly appears in our shady undergrowth like a miniature finely chiseled statue of marble. This plant has no chlorophyll and draws its food from a fungus which is itself in a symbiotic relationship with another plant, in this case, a tree and most of the time, a pin. 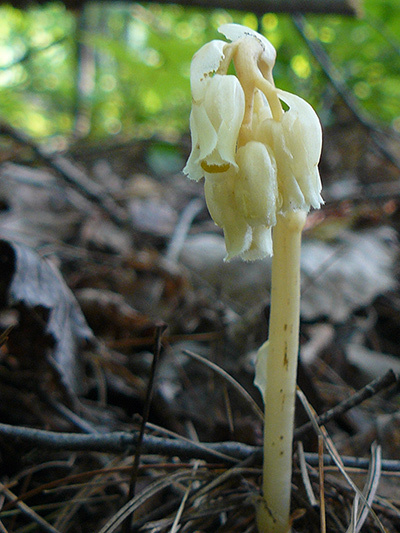 Less frequent than its cousin, the Indian pipe (Monotropa uniflora), it is also much less Nordic. A relic of another geological epoch, the tertiary (65 to 2.6 million years ago). Mostly cream colored we can find pink and even red individuals. Flowers, first leaning to the ground, straighten up as they become fruits.